Today, Mrs. Rezan Kader met the Prefect of the Congregation for Eastern Churches, H.E. Card. Leonardo Sandri at the Congregation, located in Via della Conciliazione in Rome, in Vatican City. Card. Sandri is recently returned from an important mission in the Kurdistan Region with members of ROACO (Reunion of Aid Agencies for the Oriental Churches), during which he was able to visit refugee camps and to meet with the main political and religious institutions. Cardinal Sandri remained strongly affected by the progress made with the relief and protection of the suffering and displaced people, and to all minorities. Card. Sandri invited Mrs. Kader to extend its gratitude to the Prime Minister of the Kurdistan Regional Government, Nechirvan Barzani for the warm welcome reserved to him and for the strong awareness of social issues, in particular the needs of the Christian community. In addition, Cardinal Sandri was particularly enthusiastic about the ongoing project of the Catholic University, a fundamental educational institution, to which the Prime Minister has devoting special attention. The parties also discussed the complicated relations with the central government and reiterated full cooperation by the Catholic Church in Iraq and the Kurdistan region for the reconstruction of the country. 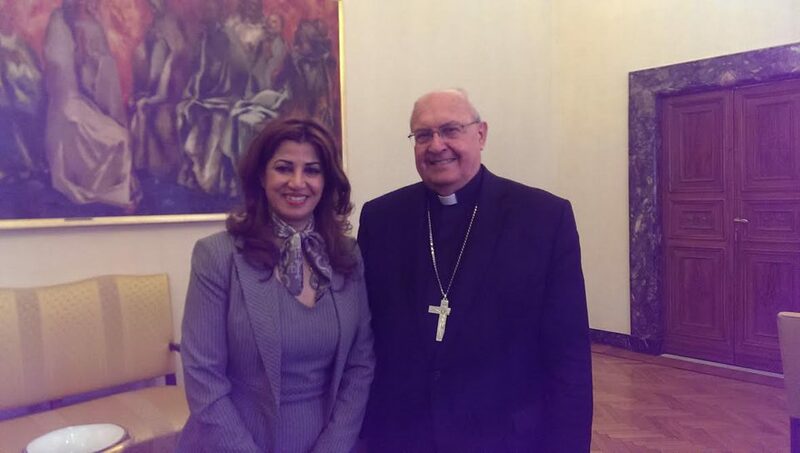 Mrs. Kader, thanked Cardinal Sandri for the cooperation and support received from the Holy See in this particular moment of humanitarian emergency, and notify him her intention to organize an exhibition of charity in favor of all refugees in the Kurdistan Region.